GUAR GUM INFORMATION AND GUAR GUM CULTIVATION IN INDIA: Guar seed and guar gum is giving return in short term trade. Guar seed and guar gum is giving return in short term trade. 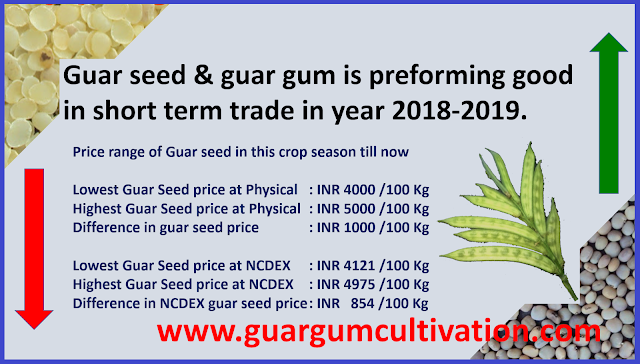 Guar seed and guar gum are major tradable agriculture commodity at NCDEX. 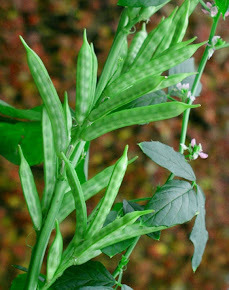 Guar is also known as cluster bean as guar pods fruits in clusters on branches. Botanically / scientifically guar is known as Cyamopsis tetragonoloba. Guar gum powder is an important industrial product used for various application in many industries. During this week Guar gum price and Guar seed prices has fallen drastically at lower level, of current cropping season in future trading at NCDEX. In physical market Guar and Guar gum prices are stronger than NCDEX guar price and NCDEX Guar gum price. Spot prices of Guar gum are stronger than the future prices of NCDEX guar Gum. Farmers and traders were expecting the better prices with decreasing arrival and increasing export demand. But NCDEX Guar and NCDEX Guar gum prices are falling against the positive fundamentals. This year Guar seed farmers and guar gum exporter were expecting better return due to limited supply of guar seed and good demand of guar gum. Rate of guar seed has not crossed the level of INR 4900/ 100 Kg. 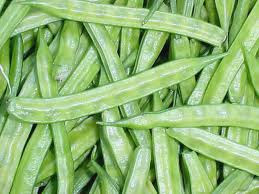 Prices of Guar gum and guar gum has fallen very low and touched the lowest level of this season. But in-depth analysis we see that prices are moving up and down regularly. Prices has gone up and then fallen, again gone up and fallen again. Any buying at lower level after price fall has given good return. Next four months February, March, April and May will be very Crucial for guar seed and guar price trends. If the guar prices will remain at higher side, then it will lead to increase the sowing area of Guar. If the price of guar seed and price of guar gum will remain toward the lower side, then the sowing area of Guar will come down further. With falling prices people are discussing that application of guar gum substitute has increased in oil and natural gas industry. This is not true. Oil drilling activities in USA are higher than previous year. 1075 Oil rigs are active in USA as on 11th January 2019, which are 136 higher than previous year. Guar gum emerging as Xanthan gum replacement. Guar seed and Guar gum commodities are being quoted strong in physical markets due to strong buying of of guar gum. Prices of Guar seed and Guar gum both are quoted stronger than previous close. Forward price of Guar seed and Guar gum are also strong due to buying at lower levels in NCDEX. 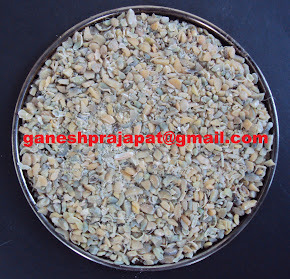 Bold quality of guar seed is traded at Rs 4300/100Kg and average quality normal guar seed is traded at Rs 4200/100 Kg. Standard quality guar gum is traded at Rs 8400/100 kg. In interior location, guar seed is traded up to 4100/100 Kg. Guar seed is being quoted high in the future market. At NCDEX (National Commodity & Derivatives Exchange Ltd) guar seed-10MT is closed at Rs 4152, 4207, 4262 higher by 0.25 percent or INR 10.5/100 Kg, 0.25 percent or INR 10.5/100 Kg, 0.48 percent or INR 20.5/100 Kg with open interest of 10660, 114700, 10590 for January, February and March month contracts. Guar gum is being also traded strong in the future market. At NCDEX (National Commodity & Derivatives Exchange Ltd) Guar gum- 5MT closed at Rs 8180, 8240 higher by 0.59 percent or Rs 48/100Kg, 0.06 percent or Rs 5/100Kg with an open interest of 1380, 70005 for January and February month contracts.